The world is rapidly changing into a smart society, as typified by the once-in-a-century paradigm shift being experienced in the automotive industry. The progress of electrification of vehicles in particular is having a negative influence on demand for specialty steels, which are our core products. However, regardless of the era we are in, as shown in our value creation model, we will respond flexibly to challenges related to the environment, society, and governance; we will continue to contribute value to society; and we will continue to grow steadily, like the annual growth rings of a tree. With this in mind, we have established our 2020 Medium-term Management Plan to depict our vision for the future with a focus on the environment of 2040, to align all Group employees toward achieving this goal, and to establish unshakable Group management foundations. Through this new management plan, we aim to manufacture ever-better products, develop better structures, and build a company of contented employees by implementing the following priority measures. In other words, on the base of compliance and governance, we will build a robust business foundation that ensures safety, quality, production, and costs, in that order, we will look ahead to 2040 to accelerate proposals for new products and services for a smart society, and we will achieve solid profits through existing businesses that are currently experiencing high demand. By 2040, it is inevitable that increased use of electrified vehicles such as EVs and FCVs will be an essential part of maintaining a sustainable global environment, and there will be a significant increase in demand for motors and batteries. We will also see many projects that we are already working on taking shape and flourishing. They include more advanced sensing technologies tied to the popularization of autonomous driving systems that will help create safer and more secure communities, and expanded applications for stainless steel through expansion of a hydrogen-based society. For a long time, I have searched for ways to contribute to society through provision of steel and other materials. I am now confident that the arrival of the smart society will create opportunities for businesses in many different fields that require our technologies. For this reason, we established the Frontier Research and Development Division in January 2018 to accelerate the pace of research and development with the aim of creating new businesses. Development focuses on areas that contribute the most to society, that have the greatest impact on our business, and that our employees can embrace wholeheartedly. We also prioritize fields with potential for new business development based on our superior materials technologies. Of course, advanced technical capabilities are important for us to convert this research into profits. We are currently working on autonomous driving support systems together with Advanced Smart Mobility Co., Ltd., a company in which we invested in February 2018. I expect that working with such an advanced company will guide and improve our technical strengths, and will enable us to demonstrate these capabilities even more. Our founder Kiichiro Toyoda had the noble ambition of contributing to the production of Japan’s first domestic automobiles using specialty steels. In the same way, we take pride in being the only materials manufacturer in the Toyota Group as we work to contribute toward materialization of a smart society through the power of materials. Two immediate issues we are facing as the cost of raw materials and energy trend upward are how to improve our cost competitiveness, and how to meet the high demand we expect to continue growing until around 2020. While systematically implementing its planned 4S Re-Engineering*1 initiatives, our Hagane Company has been thinking as a whole about how it can increase production in response to the current high rate of orders. Meanwhile, our Kitaeru Company is building a rolling mill line using new building methods, with a view to global expansion in the future as well as to strengthen its competitiveness in gear products for which demand is forecast to expand globally in applications such as next-generation vehicles. Finally, our Smart Company is building a new production building at our Gifu Plant to increase production capacity for heat-dissipating components (power card lead frames for hybrid and electric vehicles), for which we already hold a significant market share, and to create a second production site for BCM and BAP*2 purposes. The new building is expected to be operational by October this year. 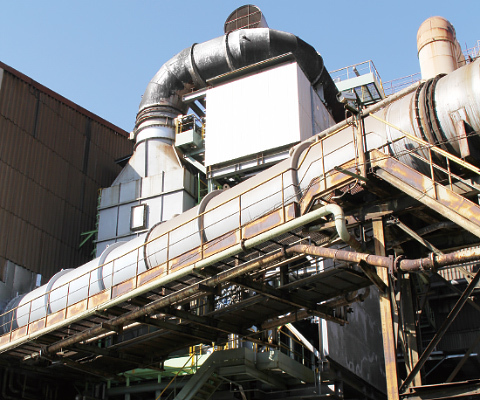 *1 4S Re-Engineering:Simple, Slim, Short and Straight production process innovations to raise productivity and achieve energy savings. As we grow the profitability of our existing businesses going forward, high additional value will be critical. We can make our customers even happier by adding value to our work. For example, we could conduct post-forging processes like cold forging and machining in-house, or we could even assemble rotors using magnets. In fact, preparations for these initiatives are already underway. I usually walk around carrying a pendulum. When we first became operational again after the January 8 accident, I used the first steel from our first rolled product to make paperweights that I distributed to employees in management positions so that the lessons we learned will never be forgotten. I attached a chain to one and made a pendulum that I use to illustrate the act of swinging the pendulum higher to convey my desire for them to think about things with greater amplitude. In the middle of great changes, it is not possible to get beyond conventional methods if the amplitude is low. I want them to look at things from a completely new perspective, to break through and make drastic changes. If we can raise awareness among everyone, we will change Aichi Steel, and make it stronger. It is important that we approach our jobs with the attitude that if we push the pendulum too far, it can always be reset. *On January 8, 2016, an explosion occurred in the No. 2 Bar Mill Shop at Aichi Steel’s Chita Plant. I am also focusing on workstyle reform. As their leader, I have instructed employees in key management positions on my basic approach and have suggested how to communicate with their subordinates, within the PDCA cycle of business execution, in a way that will encourage a vibrant workplace and workstyle reform. I am also focusing on the participation of women in the workplace, and have presented an award to a Women’s QC Team at the national presentations. Women are an essential part of our growth as a company. We are currently implementing a teleworking system and establishing a company nursery to make work easier for our employees with families. By November next year, we will also have completed construction of a recreation hall with facilities including a convenience store and restaurant. I want our employees to see we have changed. If they see the company has changed then they will think they have to change themselves as well. I want this to lead to a happier workforce. While implementing measures focused on the key phase of “Change itself and the world,” to respond to this new age, Aichi Steel has a set of values to pass down through the generations, starting from the spirit of our founder Kiichiro Toyoda. 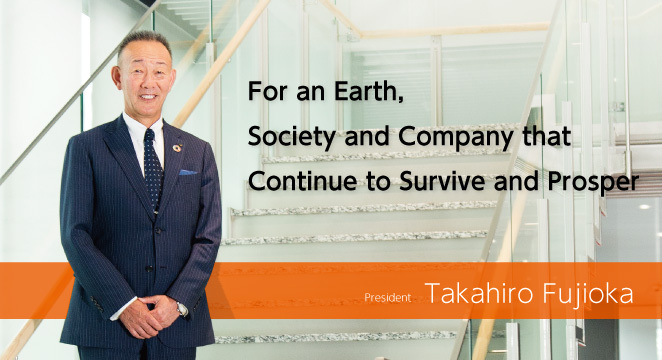 We believe that the entire Aichi Steel Group, even our expanding global operations, should follow common values and codes of conduct, such as Kiichiro’s noble ambitions. That is why we established the new Aichi Way, as inspiration for our employees in an easy-to-understand form. The Aichi Way documents our universal spiritual guide to making decisions and implementing actions at work, regardless of nationality or location. I believe that if top management continues to discuss topics like the Aichi Way and the pendulum, it will lead to transformation of our corporate culture. Rather than just increasing the number of systems and rules, it is the spread of ideas that enables cultural reform. For this reason, the role of the Aichi Way is enormous. Through these measures, and while maintaining good communications with stakeholders, I hope to continue contributing to the new society, through the starting point of materials, and to building a company of eager employees.